Cape Charles 32 with Marconi rig and squaretop mainsail. 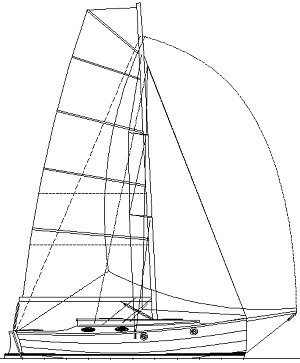 The Cape Charles 32 is the newest in the design range that started with the Cape Cutter 19. The 19 proved full of character, able and seaworthy, with a surprising turn of speed, rapidly building a following of sailors who came to appreciate her. Demand for bigger sisters soon came, so we followed her with the Cape Henry 21 and the Cape May 25. The Cape Charles 32 is a great concept for cruising Chesapeake Bay, the Bahamas, Caribbean and similar areas that have sailing waters and anchorages with limited depth. I started on this design a few years ago but my client passed on before the design had progressed beyond lines and basic layout drawings. When it got back on track last year, it developed in a slightly different direction with another client. 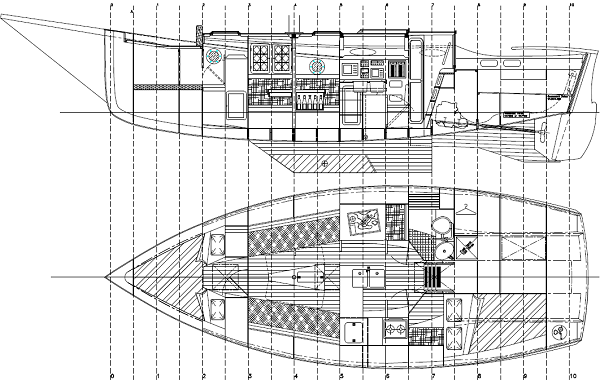 The interior layout is derived directly from the Didi 950, our racing design drawn to the Classe 950 Rule. My new client liked the Didi 950 layout and asked if it would fit. That prompted me to compare the two designs, which proved quite interesting. Although so different in aesthetics and concept, the two boats are close to identical in principle dimensions. That allowed the same basic interior to fit into the same space. 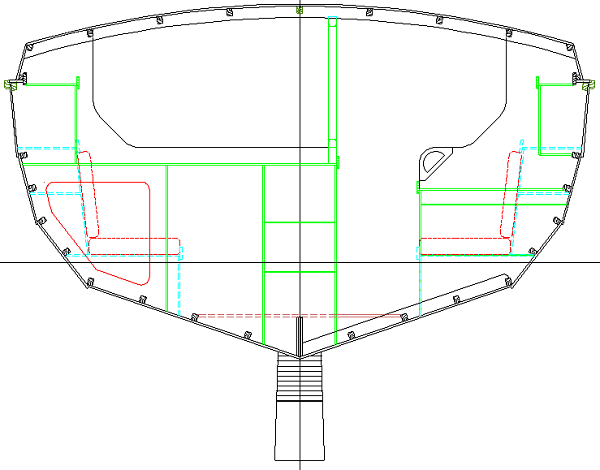 Of course this boat needs to carry more load than a racing design and be easier to handle, so it has more displacement and smaller, more manageable sail plans. The hulls of this series of designs are styled after the traditional sailing craft of England, which have spawned many modern interpretations of the basic concept. It is lapstrake plywood in construction, with carefully proportioned curves and strake widths to produce a pretty hull. In lapstrake hulls the chines are accentuated by the step in the joint, so an unfair line looks very ugly. The care that I took in shaping the Cape Cutter 19 has benefitted the bigger sisters by all being based on that original set of lines. The Cape Charles 32 is built over permanent plywood bulkheads and has a plywood backbone that runs from the stemhead through to the engine beds. The backbone, bulkheads and engine beds interlock into each other egg-crate fashion, making set-up an easy task. This backbone provides longitudinal stiffness to most of the hull as well as tying together the ballast keel support structure, reinforced with fibreglass inside and outside. The skeg deadwood stiffens the aft part of the hull. This hull is also stiffened structurally by stringers at all chines, which give a firm base on which to work when shaping and fitting panels. They also supply a fair line for establishing correct shape and fit of the panels and add toughness to the hull. Section at bulkhead between galley and saloon. The hull has good performance characteristics. It is almost all waterline length, a sure way of improving speed for a given weight under most sailing conditions. It has a fine entry below the first chine, similar to the bow of the Didi 950, with hollow to the curve of the waterline. This gives good penetration to punch to windward through waves and wind chop. Flare to the upper sections and a broad forward deck give reserve buoyancy for dryness and decent interior accommodation needed for a good cruiser. Although overall beam is similar to the Didi 950, this boat has more waterline beam to carry more load and to gain stability with the shallower draft. Aft she is quite beamy to make her forgiving downwind. This also gives the ability to carry the cockpit loads without excessive changes of fore and aft trim. Her cockpit has broad coamings for comfortably sitting out, leaning against the guardrails. The gaff rig has a high-peaked mainsail, increasing the luff length for windward efficiency. The sail plan shows two headsails, being a Genoa and a Yankee, as well as a staysail. 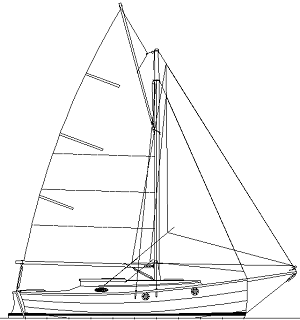 The Genoa is intended to be used without the staysail and the Yankee would be used with the staysail.The Marconi rig follows the modern concept of small headsail and large mainsail, with the bowsprit used for setting downwind sails like asymmetrical spinnakers and the very versatile code 0. High-peaked gaff rig of the Cape Charles 32. The bowsprit is hinged on the foredeck so that it can be folded aft to reduce berthing length.The mast can be set in a tabernacle to allow the mast to be lowered for low bridges or to access canal systems such as those that form a watery highway system through Europe. Raising and lowering the mast of a boat of this size must be done with care and this can be assited by using the hinged bowsprit as a lever, with lines led to the cockpit winches to provide the power. The gaff mast is hollow timber, fabricated by the birdsmouth method. The boom is goose-necked to the tabernacle rather than to the mast, allowing the mast to be lowered without removing the boom. The Marconi mast is an aluminium extrusion, or can be carbon. It is a double-spreader rig with swept spreaders, eliminating a standing backstay. We show runners coming into the mast at spinnaker halliard height, used as additional support under spinnaker or in lumpy water. We include full size Mylar patterns of the bulkheads with the stock plans, to assist those building from scratch. We also offer optional Mylar patterns of the hull panels, useful for those builders who are concerned about cutting the correct shapes for the hull skin. CNC plywood kits will also be available from our normal USA and international kit suppliers. Most builders who take on this project will learn some new skills along the way. That is one of the reasons why we build our own boats rather than buying. Any handyman of reasonable ability should be able to produce a Cape Charles 32 of which he will be proud. This design is dimensioned with both metric and imperial measurements.